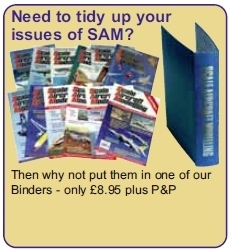 Store your back issues in purpose made binders, protecting your valuable reference library. A new addition to this highly-acclaimed pair of flexible stainless steel rules both feature 1:72 and 1:48 scale, metric measurements in 100mm divisions; fine and medium saw edges; circular, square, oval and hexagonal templates; and four rows of spaced rivet templates. This highly-acclaimed pair of flexible stainless steel rules feature 1:35 & 1:72 scale (large rule), 1.48 & 1:76 scale(small rule), measurements in three divisions; fine and medium saw edges; circular, square, oval and hexagonal templates; and four rows of spaced rivet templates. 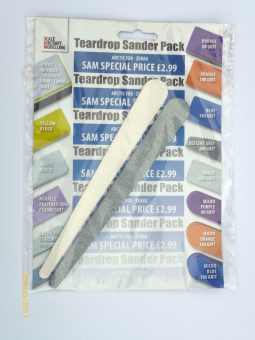 Contains the 'Zebra' & 'Arctic Fox' teardrop Mylar sander. 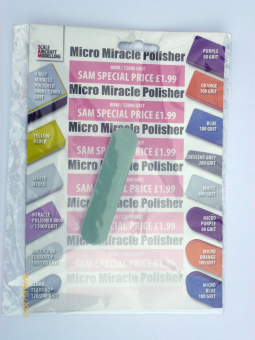 Solvent Friendly and wet & dry capable, these highly durable and long lasting sanders are ideal for heavy duty work. This amazing tool carries 2 different grits on its 4 sides and the pads can be removed from the sponge core to create flexible and highly maneuverable sanding pads. 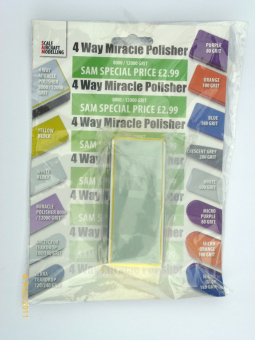 Exactly the same grit and quality of the 4 sided Miracle Polisher, just produced a a 2 sided sander for small scale modellers.